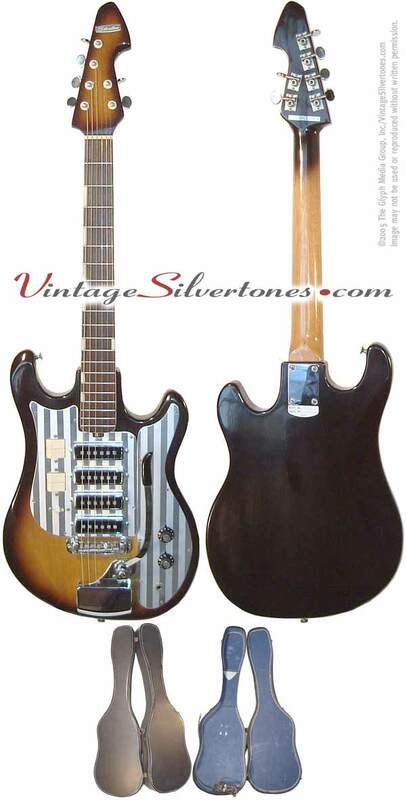 This is a 1965 Silvertone made by Teisco of Japan. This guitar has four pick ups that provide an incredible array of tones. It has a fully functional whammy bar and is a solid body. It's action is set fast. This electric guitar is in almost new condition. The finish is a very rare natural burst; I haven't seen another four pick-up model in this finish. The neck is straight and all the electronics work properly. The guitar includes the original case and cable. The case is worn but works fine. The Teisco model number for this guitar is WG-4L. Both players and collectors will love this guitar; it's feels and sounds great while playing and looks beautiful.